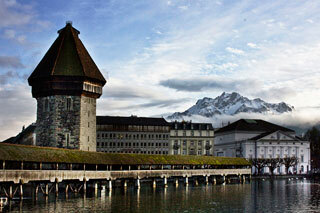 Since Lucerne straddles the Reuss where it drains the lake, it has a number of bridges. The most famous is the Chapel Bridge (Kapellbrücke), a 204 m (669 ft) long wooden covered bridge originally built in 1333, the oldest covered bridge in Europe, although much of it had to be replaced after a fire on 18 August 1993, allegedly caused by a discarded cigarette. Part way across, the bridge runs by the octagonal Water Tower (Wasserturm), a fortification from the 13th century. Inside the bridge are a series of paintings from the 17th century depicting events from Lucerne's history. The Bridge with its Tower is the city's most famous landmark. This article uses material from the Wikipedia article "Lucerne Covered Bridges", which is released under the Creative Commons Attribution-Share-Alike 3.0 License.